$85.00 In stock. Order in the next 18 hours, 8 minutes and it will go out today! Imagine you putting an object -- any object -- into a change bag and suddenly the rim of the bag is engulfed in flames! Now, with Jim Pace's Extreme Change Bag, you can make it happen. This is a revolutionary way to perform a transformation. Here are just a few great ideas that you can do at a kid's birthday, school show or family show with this clever prop that takes the traditional prop to a whole other level. Put a piece of (sponge or real) bread into the bag, add a dose of fire and pull out toast! Put a white silk into the bag only to have it burst into a flash of fire and... Whoosh... it becomes a live dove. Put a "borrowed" sock or tie into the bag, say the magic words and feign horror when it catches on fire. Pull out the "burnt" article of clothing. Then change it back. Use it for a "Baking Cupcake Trick." Add the ingredients and pretend not to see the fire. (Don't worry, the kids will tell you!). Then pull out a sponge cupcake. 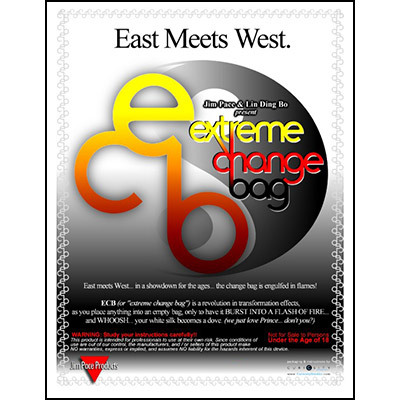 Extreme Change Bag is a great utility device if you want to add a flash or a big "mistake" to your show. Use it to pretend to burn, vanish or materialize any small object.